More stuff from Bill Hamilton's collection. These are mainly Glasgow Tigers related pictures, spanning from 1947 to 1973. The Toronto Motordrome - The Only Board Track in the Commonwealth? An interesting article from Brian Pratt on board track racing in British Columbia in 1914. Although it's not speedway, it's a very close equivalent. Thanks to John Hyam for his help with this piece. Friends of Speedway are pleased to announce the date of the above reunion to be held on 8th October 2017 at the Country Park where the speedway took place. All are welcome to attend and please bring any memorabilia that you may have. "Been a member of sim speedway now for three years and I've enjoyed every minute of it. Well worth getting involved with if you have some time to spare. When I say time, no more then an hour is needed, but more depending how involved you wish to get. Always nice to have new members." "As a sim speedway manager for the last 3 seasons I have to say it's compelling, can't wait for the week's results and the number crunching when re-declaring. Having experienced a league win and now battling relegation it's chock full of highs and lows. Don't worry if you're a newbie the forum website is fully interactive and there's loads of good advice and help. I love it !! 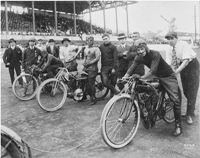 - Let the Bullets Fly (Bottesford Bullets race at the Bullet Arena, North Lincolnshire)"
Ivor Craine tells us about some of the riders who came through at the Maribyrnong Speedway in Melbourne. If you've ever fancied running your own speedway club, but don't have the endless supply of cash you'd need, then Sim Speedway could be up your street.The guys who run the game are always looking for new players. Here's a bit of history on the game and details of how you can get involved. "Enjoyed your article. May they r.i.p. Think I saw them all including West Ham visit Exeter, my home. Sverre was great as many of the other guys, of course. Simmo was brilliant around Exeter as was, Phil Crump, Mike Lee, Gordon Kennett and others too many to name, but they live on in my memory box. Would love to have gone to the Custom House." "I found it very interesting to read comments on Deagon and Davies Park. My Dad rode under an assumed name until he had a fall and had to admit his real name. "